Greetings to you, one of the thousands of members of the national chemical societies that make up ChemPubSoc Europe. Your Society and Wiley-VCH take this opportunity to share some of the great things that are going on. 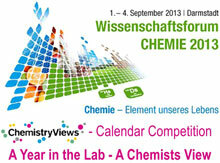 This newsletter is brought to you by ChemistryViews, the online service of ChemPubSoc Europe. ChemistryViews.org offers news, research highlights and additional feature material from leading authors, as well as educational material, workshops, videos and interviews. Do you want regular information on research highlights? Register for your free ChemistryViews Newsletter. 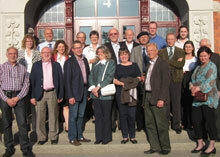 This years' ChemPubSoc Europe Owners Meeting was hosted by the Swedish Chemical Society. The owner societies decided on a special member rate, welcomed a new society and appointed an Editor-in-Chief. See how their decisions affect you! 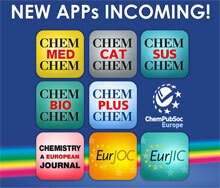 ChemElectroChem is a new journal in the family of ChemPubSoc Europe journals. Read about its scope and get free access to the first papers. The articles at ChemElectroChem are available free throughout 2014, once your institution has registered for free. Please find a selection of great electrochemistry. Good news: Chemistry Open has been accepted in the abstracting service Web of Science of Thomson Reuters… and all issues since its inception will be covered. The first Impact Factor is expected in June 2014. Read a viewpoint on the 2013 Wissenschaftsforum and discover who won the GDCh prizes awarded there. Dr Kallol Ray won the Wöhler-EurJIC Young Investigator Prize. 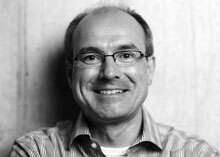 The prize was awarded by ChemPubSoc Europe and a division of the Gesellschaft Deutscher Chemiker (GDCh, German Chemical Society), the Wöhler-Vereinigung. New exciting Apps provide an entirely new browsing and reading experience for the whole range of ChemPubSoc Europe Journals. Go to this site to see what advantages they bring you and watch the video for more information. Save this link, as the new apps of your favourite journals will be added as they appear. Electronic functions facilitate the reading of a scientific article, providing all features that you always wanted. The full text of an article is reprogrammed to be perfectly displayed on an iPad. Figures, references, and supporting information are presented in a sidebar, which you can scroll through, while you are reading. If you see something that you like you can save or share articles. Vera Koester from ChemViews Magazine talks with Bert Weckhuysen, Co-chairman of ChemCatChem, scientific director of CatchBio and Professor of Inorganic Chemistry and Catalysis, Utrecht University, the Netherlands, Elisabeth Bouwman, project leader and Professor of Inorganic Chemistry, Leiden University, the Netherlands, and Ed de Jong, Avantium Chemicals B, Amsterdam, the Netherlands, about their experiences with CatchBio, what they expect from the project, and why it is so unique. Please note that this e-mail was sent to #EMAILADDR#.